When I Say “White Privilege” Do You . . .
. . . roll your eyes?
. . . feel ashamed?
. . . get angry?
. . . want to talk about it? I write this as a privileged white person living in the USA. I have orthodontally straightened teeth, a driver’s license and car with new tires, a house with a big yard in a safe neighborhood, medical and dental insurance, three higher education degrees, annual paid vacations, a cell phone, a Kindle, an iPad, a laptop, reliable electricity and plumbing, central heating and air conditioning, regular hair cuts, occasional pedicures, a Starbucks gold card, cable television, streaming television, a dishwasher, a microwave, a double-wide fridge with ice maker and water purifier, one and a half bathrooms, memory foam mattresses, access to public transportation, occasional meals out, and (until they died) a mother and father with exceptional capacity to parent me. I am rich. I am profoundly privileged. As long as we who are white and privileged see ourselves as the default race and culture, we will not be able to connect with The Other as Jesus did. This is totally about Jesus for me. Not only did God put on skin and move into the neighborhood (as Eugene Peterson famously transliterated) but then Jesus moved out of the neighborhood into Samaria, across the Jordan, in Tyre and Sidon. He crossed gender, class, and religious borders. As long as these stats continue to be the truth about our future, we who have been the majority will need to adapt and try to understand what has been our privilege based on the light color of our skin. My own denominational middle judicatories will be making a concerted effort to send as many people as we can to the White Privilege Conference in 2016 in Philadelphia. I hope to see you there. We have some things to learn. 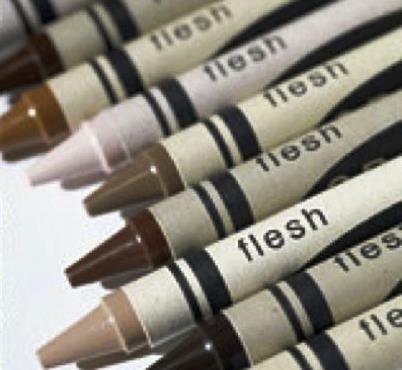 Some of us will be old enough to remember when the “flesh” colored Crayola crayon was “white.” This image makes more sense. We are guitly of a lot of what I have heard called “culteral imperialism”. As a conservative of the 17th century kind, and the kind that says “I Like Ike”, I call much of the modern conservative stuff idiocy. But the Progressives share a lot of their own cultural imperialism as well. I miss the old liberals who at least thought that everyone had a right to their own opinion. Thank you Dennis. I agree that we are equal opportunity imperialists. Whether we self-identity as conservative or progressive, we tend to shun those with whom we disagree. Pingback: » When I Say “White Privilege” Do You . . .